The Law Offices of John T. Orcutt in Garner (South Raleigh), is located off of Highway 70 near the First Baptist Church of Garner. If you and your family are suffering from over whelming debt, then the Law Offices of John T. Orcutt can help. The U.S. Bankruptcy Law was designed to help good people find relief from the burdens of debt. 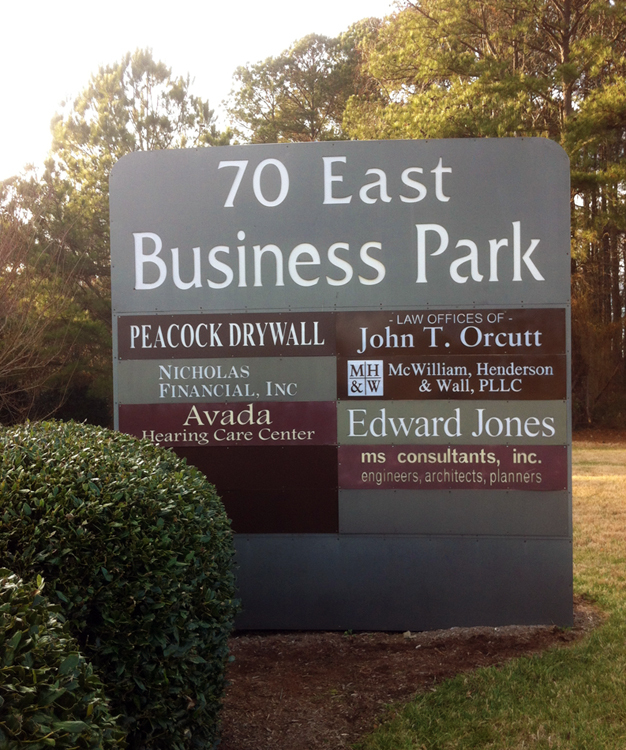 If you live in or around Garner North Carolina, our offices are located We are located off Highway 70 West. Click the interactive map below to get easy directions to our office. FIRST, you must make your way over to route 70 in the area between Garner and Clayton.The office is located at 143 Highway 70, Garner, NC 27529 in the “70 East Business Park”, which is located on route 70 between New Rand Road and route 50. If you are traveling East on route 70, like you would be if you were traveling away from Garner and toward Clayton, after you pass under the overpass at the intersection of route 50, you will go about 300 yards and then turn right into the 70 East Business Park, which is a set of 2 long, one-story, red brick office buildings. (PLEASE BE CAREFUL: The entrance to the 70 East Business Park will come up very quickly, and it is extremely easy to miss the entrance. Unfortunately, if you miss the entrance, you will have to turn around on route 70 and go all the way back up to the route 50 overpass in order to turn around and come back.) After you turn into the 70 East Business Park, we are the unit 143, which is the last unit on the right. If, on the other hand, your are traveling west on route 70, away from Clayton and toward Garner, our Garner office is located on the left about 1 and one-half miles past the intersection of route 70 and interstate route 40. After you pass the intersection of interstate route 40, traveling west on route 70, you will first pass Jones Sausage Road, which is actually Jones Sausage Road on the right and White Oak Road on the left. Continuing on route 70, you will then pass the intersection of route 70 and New Rand Road. 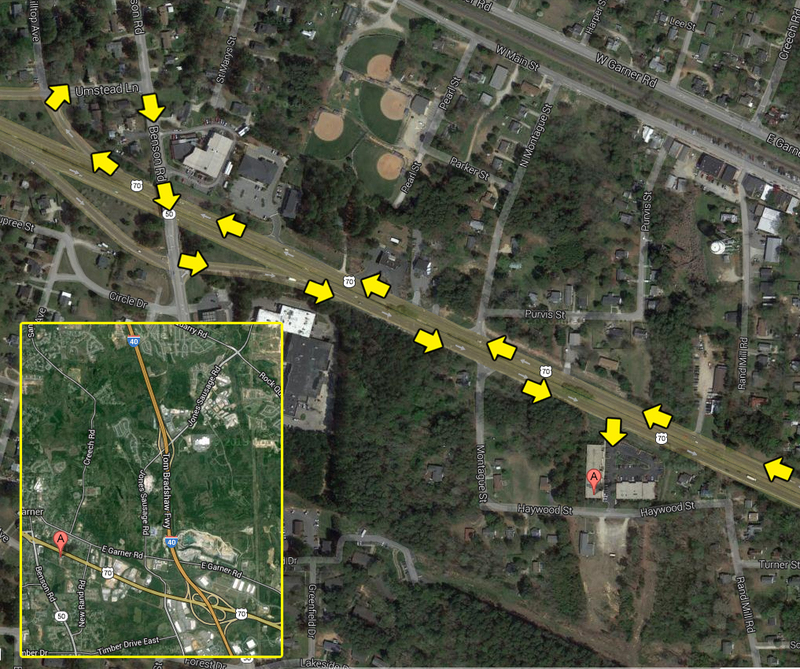 Our office is located on the left in the 70 East Business Park, which is about a quarter of a mile past New Rand road. Our office is located on the left in the 70 East Business Park, which is less than a quarter of a mile past New Rand Road. The 70 East Business Park is a set of 2 long, one-story, red-brick office buildings. Unfortunately, because the lanes of route 70 are separated by a median, you cannot turn left into the 70 East Business Park. Instead, you must turn around at the next intersection, which is the intersection of route 70 and route 50. To do this, bear right off of route 70 as soon as you pass under the next overpass. Then, travel back across the overpass and make an immediate left turn, which will put you back onto route 70 going the other way. You will then travel about 300 yards to get back to the 70 East Business Park, at which time, you will turn right. (PLEASE BE CAREFUL: The entrance to the 70 East Business Park will come up very quickly, and it is extremely easy to miss the entrance. Unfortunately, if you miss the entrance, you will have to turn around on route 70 and go all the way back up to the route 50 overpass in order to turn around and come back.) After you turn into the 70 East Business Park, we are in unit 143, which is the last unit on the right.